Can you let us know the pinout for the iPhone input cable and why can’t I select a middle point in the output level on the iPhone app? It’d be great to find out the pinout for the Tentacle to iPhone/iPad cable to input/record TC on one of those apps. Also, I find that adjusting the output level on the app (iPhone) from line or mic to something in between automatically goes back to mic or line (whatever the middle point is closest to). This does not happen on the computer app, only on the iPhone one, where no increment adjustments are available (straight line instead). 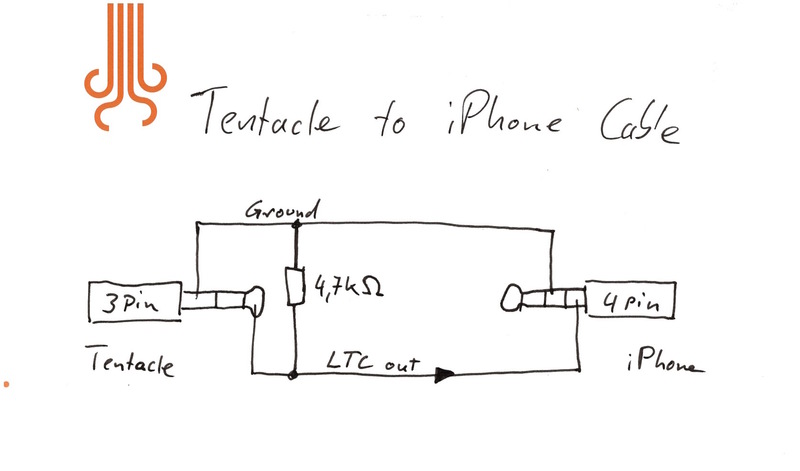 I have attached you a quick and dirty pinout for the “Tentacle to iPhone Cable” to record timecode on your phone. For all the others reading this post: Please note that this cable is only intended for recording timecode on your phone or for using apps like MovieSlate. It is different to the white 4 Pin TRRS “iPhone Setup Cable” wich comes with every unit. Regarding your experience with setting the output level I think the reason is that you might have changed the output level to fast to mic and line and the mid point and so on. What happens behind the scene when you change something is that an audio command will be send to the Tentacle followed by an audio command that reads the actual value back to check if the volume has been set correctly. This all takes some time. If you do this quickly in a row, the responses will cue up and update later. This is why you might experience this behavior. So my suggestion is to set the volume once and wait a few seconds, before doing the next change. One tentacle works and the other doesn’t. This is getting me confused! Is one of the outputs of the tentacle set at mic level? Both at the exact same level. Any idea of why is this happening Ulrich? Timecode outputs well as I can hear it if plugging headphones in in both units, weird one this one.